The Walking Dead ranked second on the DVR list, but finished as the No. 1 show in video-on-demand viewing as well as OTT. 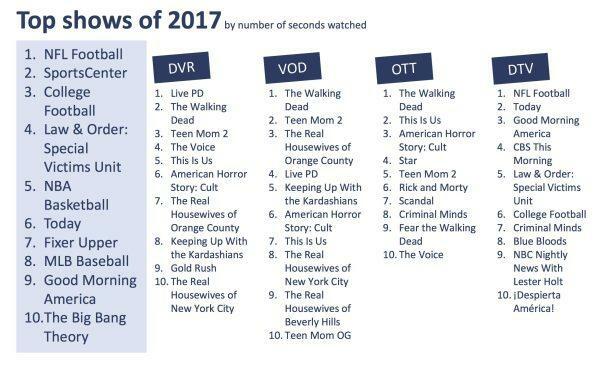 Unscripted shows Teen Mom 2 and The Real Housewives of Orange County, which belong to a genre typically thought of as the kind watched live, ranked No. 2 and 3, respectively, on the VOD chart. While sports has given up some ground of late, it still casts a long shadow in the Inscape rankings. On the list of the top 10 shows viewed live, NFL football, college football, basketball and ESPN’s SportsCenter occupy five of the spots. Compared with others in the measurement game, smart-TV players like Inscape have access to a much broader sample of viewers. That means they can go granular and capture more precise information on viewing, regardless of whether programming is watched live via antenna, internet or cable box, or time-shifted via VOD or DVR.